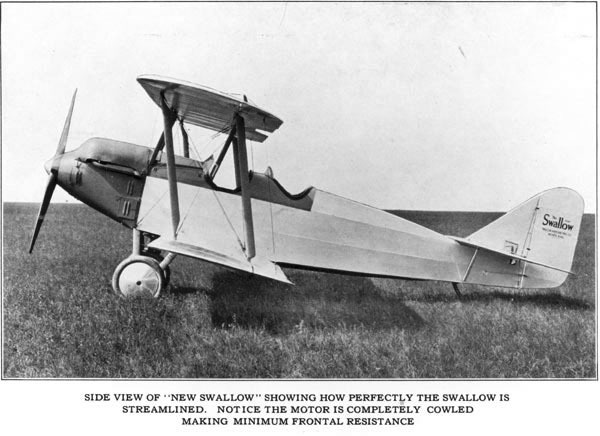 Description: Side view of the New Swallow Airplane manufactured by the Swallow Airplane Manufacturing Company. Swallow Field was located at 2401 North Hillside. Description: Walter Beech and his "Travel Air B6" Special Racing Plane for the National Air Tour. Travel Air Manufacturing Company was located on East Central. Description: View of "Maiden Wichita," first airplane produced by Travel Air Manufacturing Company. Prototype for Travel Air Model 4000 was powered by Wright J4 radial engine. 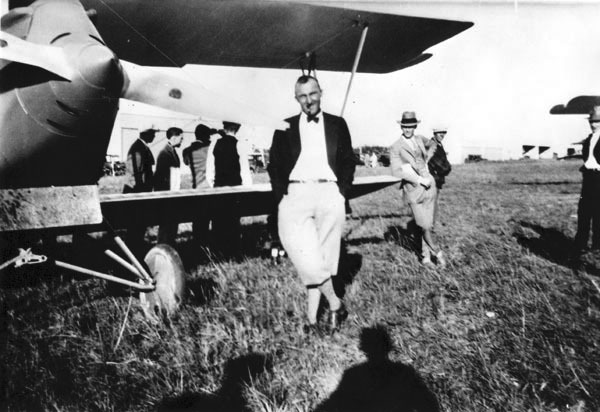 Description: Walter H. Beech (left) and Brice Goldsborough pose by their Travel Air B6 airplane. They teamed to win 1926 Ford Commercial Airplane Reliability Tour. 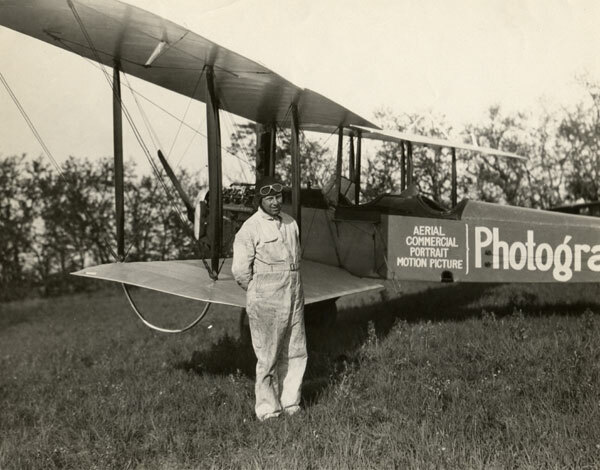 Description: Commercial photographer Edgar B. Smith posed with his bi-plane. Smith’s aerial photographs of downtown Wichita gave Wichitans a previously unseen view of their city. Keywords: Business and industry, aviation, airplanes, photography, people, Wichita. 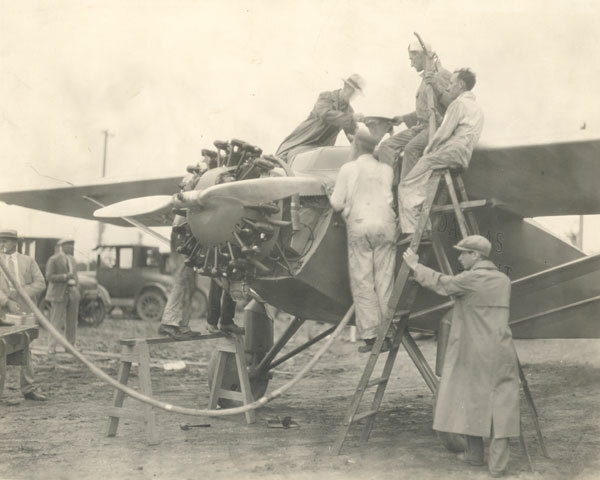 Description: Refueling the Swallow Airplane Company "Dallas Spirit" Monoplane. This plane was lost at sea during the Dole Race. The Swallow Airplane Company was located at 2401 North Hillside. Description: Travel Air Model 5000 flown nonstop from San Francisco to Honolulu by Arthur C. Goebel, fifth from right, to win Dole Race. Designers of airplane, Walter Burnham and Herb Rawdon, are second and third from left. Others, from left, are Howard Baccus, William Hauselman, "Pinky" Grimes, Ted Cochran, Ralph Morton, Harold Brooks, Horace Weihmiller and Clarence Clark. Description: Seventeen men stand on wing of prototype model of Cessna cabin monoplane. Stunt was to demonstrate strength of airplane without wing struts. Photograph taken August 1927. Keywords: Wichita, aviation, business and industry, people, Travel Air Manufacturing Company, airplanes, interiors. Description: Interior view of Travel Air factory on southeast corner of Central Avenue and Webb Road. 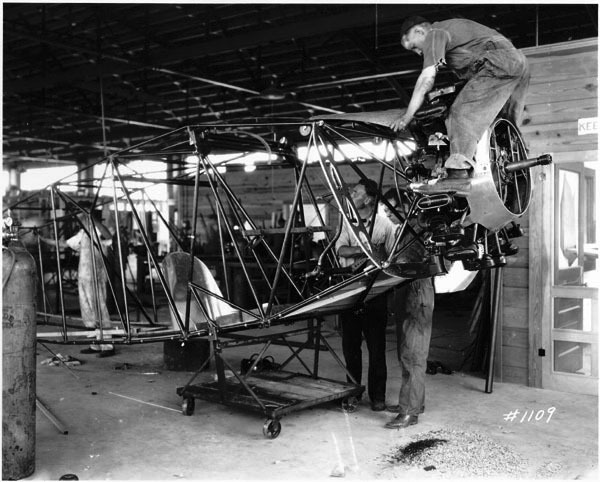 Employee works on partially completed fuselage of Travel Air airplane.